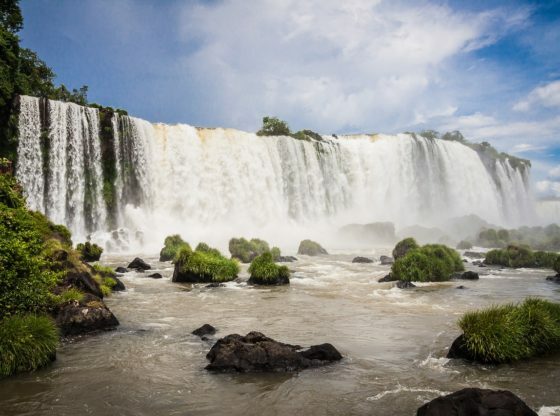 Visiting these amazing waterfalls are a must do for those visiting South America. It is probably the most active and fun border crossing/sightseeing you will do. I haven’t visited a border with such beauty before or since. Although the border crossing itself isn’t that amazing, with the falls split across, its ideal to visit both sides I spent just two days in the area, one on the Brazilian side and the other on the Argentinian. Here I’ll give you a brief of my two-day itinerary, so you can plan something similar, this is ideal for those with limited time such as I had or for those who don’t like hanging about unnecessarily. I travelled from Brazil down and into Argentina so for those doing the opposite some adjustment might be necessary. We arrived into Foz the Iguazu around midday and took a taxi to our hostel. After check-in, we went for some food and took a local bus to the Brazilian side of the falls arriving around 2.00pm. The bus was number 120 and can be easily found going throughout the town. We paid for our entrance and boarded the bus which takes you on a 15-minute drive to the falls. The sights are immediately impressive and as the path only runs one way it is very easy to follow if you’re not distracted by the falls for too long. At the very end of the walk, you can stand at the base of the falls and get covered in water, nice and relax after a day spent on buses and walking in the sun. It’s a simple walk and lasted no more than an hour or two. We then returned to Foz by the same local bus. It’s quite easy and relaxing, perfect after a long day of travelling. I arranged through my hostel for a shuttle bus to take me to the Argentina side the following day and onwards to the bus station after our visit to the falls. This was ideal and turned out to be both time and cost effective. We woke at 7.30am to grab breakfast and then the shuttle, which arrived at 8.30am. After picking up some passengers we went through the borders easily and arrived at the Argentina falls around 10.00am. Here we found that cards were accepted for payment and ATMs were available, although it had been advertised that they were not. This side is much bigger than the Brazilian side and contains three walking trails and a short train ride. We spent the entire day up until 5.00pm going along all the trails and seeing the falls from dozens of vantage points. This left plenty of time for a picnic, photo opportunities and rest times.